Dr. David Bogorad received his medical degree with honors from New York University School of Medicine. Dr. Bogorad has performed over 5,000 LASIK procedures for the last 20 years, ever since the Excimer Laser was first approved by the FDA for Laser Vision Correction. He is a Fellow of the American College of Surgeons, a member of the International Society of Refractive Surgery and has been selected as one of the “Best Doctors in America” since 2003. In 2015, Dr. Bogorad was named as a “Top Doctor” by Castle Connolly. He is a past President of the Georgia Society of Ophthalmology. 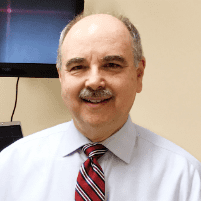 He currently serves as Professor of Ophthalmology, Vice-Chairman at Augusta University Department of Ophthalmology and director of the AU Refractive Surgery Service and Eye Care Laser Vision Center. After being elected by the Medical College of Georgia faculty, he has served as Chair of the Augusta University Medical Associates Foundation.